When it comes to preventive maintenance and vehicle care, most Whitehall drivers know how important it is to check their brakes. But brakes are more than just brake pads and shoes. There are a lot of components in the brake system, and they all need to be in good working order. But your braking system also has mechanical parts. These pistons and springs can also gradually wear out or get gummed up by oil, dirt and other road spatter. A brake inspection at Tuffy Tire & Auto Service Whitehall in Whitehall includes a check of these parts as well as the pads and shoes. Your friendly and knowledgeable pros at Tuffy Tire & Auto Service Whitehall can then advise you of any parts that need cleaning or replacement. 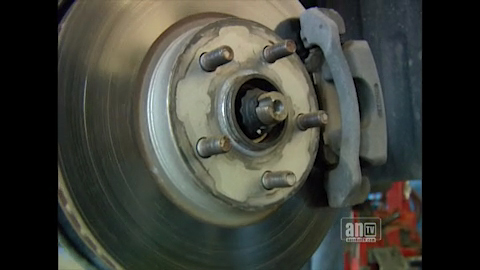 The fluid component to the brake system needs a regular check-up at Tuffy Tire & Auto Service Whitehall as well. The brake fluid cools and protects your brake system. Protective additives are gradually depleted by the operation of the brake system, and moisture buildup inside the fluid can diminish its effectiveness. When you have your brakes serviced at Tuffy Tire & Auto Service Whitehall in Whitehall, the fluid should be checked and, if needed, replaced, which will clean out water, debris and dirt. This is particularly important on wet Whitehall roads. A good tire will give you good braking on either wet or dry Ohio roads. But stopping distance increases dramatically when worn tires meet wet roads. Tread on a tire acts to channel away water as the vehicle passes over the wet road, improving contact between the tire's surface and the road; that maintains traction. But the thinner the tread, the less effective the water channels become, and water can get between the tire and the roadway, reducing friction. A loss of friction means a longer stopping distance and possibly the loss of control. Regardless of what kind of car you drive in Whitehall, it is always good auto advice to keep your brake system in good repair, and that means ALL of your brake system. Just one more way to keep your travels accident- and worry-free.